Let’s start a campaign calling all Egyptians to Follow a hard Diet in order to support The Egyptian Government’s Big Belly. The Egyptian Government announced earlier that Egyptians are consuming too much and they should help the government in consuming in general specially regarding electricity and water. The government also announced that it is enough for the Egyptian Citizen to eat daily 3 loaves of bread. 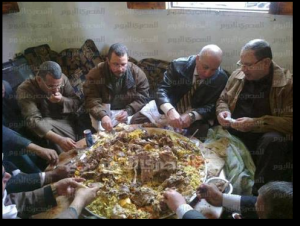 While the Egyptian Prime Minister in the following image is eating meat. Of course he eats meat, because meat is very nutritious, delicious and it makes the Prime Minister feels very ambitious! Meantime, Those who are spreading rumors and lies about electricity and water are not shut off at any time at President Morsi residence and not at all at Ministers and Prime minister and the Government responsible residences, know that the electricity and the water are not shut off in their residences by coincidence and not deliberately, because like many Islamist mentioned before and specially Dr. Manal Abu Elhassan (The secretary of the brotherhood political party “freedom & Justice) President Mohamed Morsi is chosen and called by God to rule Egypt. Oh my God, that’s a miracle! Of course Electricity and water are not shutting off because it is a miracle! it is protected by Angels! What can the Prime Minister do to those citizens who can’t afford to eat meat at all?! Does that mean that he should starve himself to death, to feel how poor people are suffering from the malnutrition?! Prime Minister also mentioned before that the Egyptian citizen is using the Air Conditions too much in the hot summer, and they should consume electricity by wearing Cotton and all the family to stay in one room. And don’t tell me that there are about 40 million Egyptians who live under poverty, they don’t even have a fan! that is also a lie and an rumors spread by the enemies of the Egyptian Government great success! 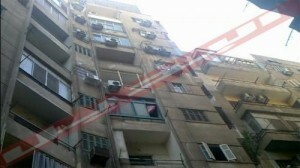 The following is the building where the Prime Minister lives in Cairo, the building has 160 Air Conditions: According to the neighbors of Prime minister and Neighbors of President Morsi, they do not have any problem in relation to water or electricity.